JBC Tools C245 Chisel cartridge range is the largest selection of JBC tips with many shapes, sizes and special models. 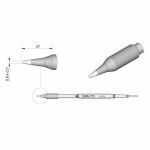 They are appropriate for general soldering purposes and they are perfect for both SMD components or for applications with high power requirements such as ground plane soldering. The C245 series last 5 times longer than other brands thanks to the Exclusive Heating System and the Sleep & Hibernation features. Purchase JBC Tools C245 Chisel Series Tip Cartridges sold by Howard Electronics Today!